Home Content Regulation Government's Notification on Digital Surveillance: Is it enough to satisfy our Courts? Government’s Notification on Digital Surveillance: Is it enough to satisfy our Courts? The Court has asked central government to file its reply within six weeks. Thereafter, the Court will also consider the interim prayer seeking immediate stay on the MHA notification. The PILs have been filed by Manohar Lal Sharma, Amit Sahni, Mahua Moitra, Shreya Singhal and Internet Freedom Foundation. The Supreme Court in its recent judgments on the Justice K.S. Puttaswamy vs Union of India popularly known as the ‘Privacy Judgment’ of 2017 and Aadhaar has established the twin tests of ‘necessity’ and ‘proportionality’ as the basis for judging such measures. A plain reading of the MHA circular suggests that it fails on both these stands. The language of the circular is such that it indicates towards a possibility of collecting and utilizing sensitive personal information on an unprecedented scale. The circular refers to ‘information generated, transmitted, received or stored in any computer’. The circular states ‘interception, monitoring and decryption’ as its purpose. This implies that intelligence gathered by these agencies may be used for any as long it fits into ‘their’ broad understanding of ‘monitoring’. This may be the most worrisome aspect of the circular, especially because there is yet no Data Protection Act in the country. Well-intentioned but is it practical? 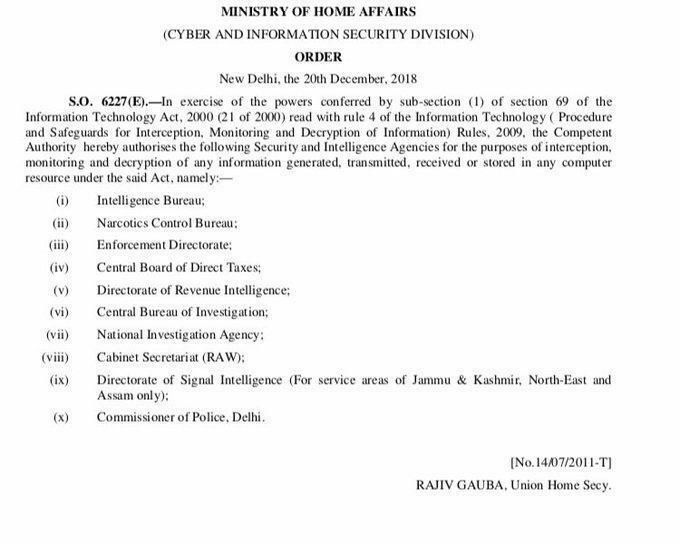 It is not clear if the order intends to be an executive fiat for blanket surveillance, or whether each specific instance of surveillance that is undertaken will still have to go through the process of obtaining permission from the Union home ministry. Even if the order intends to only facilitate targeted surveillance based on case-by-case clearance, the problem lies in the safeguard of ‘judicial application of mind’ in processing each request for interception being reduced to an exercise of mindless approval of letters. Also, let’s not forget the 2014 report by Delhi based NGO Software Freedom Law Centre where it was found that the Union Home Ministry approves close to 7500-9000 requests for phone interception every month, which at the least, amounts to 250 authorisations per day! With such numbers it is practically impossible to exercise reasoned and deliberated judgment on every application. Will the notification be able to satisfy the “national security” explanation? Justification of national security has favored the Government in surveillance cases across the world. Even courts in India have relied upon the Executive whenever the National Security argument is introduced. Again, the Court could be reluctant in striking down this order, in the backdrop of rising terrorism and it is perhaps understandable because they may feel that stripping the security agencies of their powers makes the Court indirectly responsible for terrorist activities that could follow in the coming times. Without any doubt, the MHA order will aid the security agencies in their investigative capabilities but what remains to be seen, even apart from fears of misuse, is that how much actual security such a measure would provide? By alluding to national security, the notification has played up a prevailing anxiety among the public to justify this disproportionate power. A direction issued under the section includes “interception for the purposes of investigation of offences and preventing incitement to offences”. The current directive enlists agencies such as the Narcotics Control Bureau and Central Board of Direct Taxes, which seems to suggest that these powers may be utilized for the detection of financial and narcotics related offences as well. This goes against the government claim that these powers are reserved for exceptional cases, especially those relating to national security. With such over-broad language, excessive delegation of powers and no clear accountability in the notification it will be interesting to see what the Supreme Court decides. Previous articleWHY DON’T WE SYNC?